This will go down as one of the worst seasons ever in Buffalo Sabres franchise history. Not only do they have the worst record, they have also scored the least amount of goals. With 150 goals scored, Buffalo set the NHL-low in the league’s post-expansion era that began in 1967. The previous low was 151 scored by the Tampa Bay Lightning in 1997-98. With the season coming to a close, the front-office have some decisions to make. 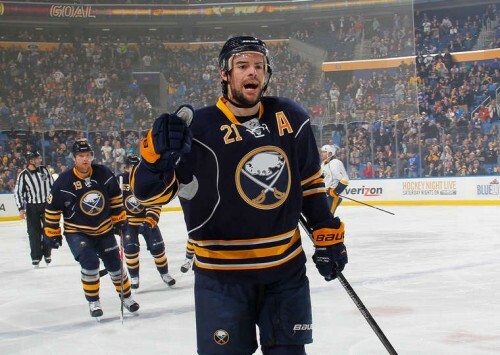 Sabres fans, if you had to guess how many points the leading scorer for Buffalo has, how many would you guess? If you guessed 50, then you have overbid. Forwards Cody Hodgson (44) and Tyler Ennis (43) finished neck to neck in the points race. Just think about this for a moment, Sidney Crosby has more assists (67) than these two players have points. In addition, there are also more than 100 players in the NHL who have more points than Hodgson and Ennis. Some names that might surprise you include Tyler Bozak (49), Mark Giodarno (47) and Nick Bonino (47). Drew Stafford has been playing better as of late. Through the first 3 months of the season (40 games) Stafford had scored 4 goals and collected 9 assists. March was his best month of the season when he scored 5 goals and added 2 assists. If Stafford could play a full season and be productive like his March stats, then perhaps he is worth his salary of $4 million per year. Ville Leino may be the worst signing in the history of signings. He scored his first goal of the season recently, sort of. The Sabres went into a shootout with the New Jersey Devils. Leino was the 9th shooter for Buffalo and he beat the Devils goalie. Here is the thing, shootout goals DO NOT count toward a players’ goal total. In essence, he has 15 assists in 57 games and NO GOALS (That’s roughly $300,000/per assist…..). Leino needs to be bought out as he is the highest paid forward and he can’t put the puck in the net. The Sabres have a great chance to get the #1 pick in this year’s draft. Finishing with the worst record in the league has allowed them the best chance the NHL Draft Lottery. Buffalo should draft a high scoring forward, who can score goals, lots of them.